What’s the Plan for 2014? De-Clutter! Now that Christmas day is over, it is time to form my new New Years resolution. I’m not a big fan of them but do think that it is a good idea to give ourselves goals for the coming year. I’ve decided this year, after a realization of just how much stuff we have accumulated, that I am going to simplify life. There are so many extra things in my life and many of them never get used or touched! This year I want to get rid of a lot of junk. Physically and spiritually. When things begin to pile up in my house, they take up much needed space. Our home isn’t very big and pretty much every nook and cranny is filled with stuff. Much of this stuff is never used. It is just wasting good space with clutter. Jesus’s words ring true in Luke 12:15 NIV15 Then he said to them, “Watch out! Be on your guard against all kinds of greed; life does not consist in an abundance of possessions.” More is not better as we read in Matthew 6:19-21 NIV 19 “Do not store up for yourselves treasures on earth, where moths and vermin destroy, and where thieves break in and steal. 20 But store up for yourselves treasures in heaven, where moths and vermin do not destroy, and where thieves do not break in and steal. 21 For where your treasure is, there your heart will be also. The same can be said for the things I allow in my personal life. Things that are taking up my time and abilities that are not really being used for God’s purposes. For example watching tv. I don’t watch a lot of tv but I find myself in the winter months gravitating to it more. Instead of spending my free time watching tv, I want to replace some of that time clearing clutter from my home. The less clutter I have to work around, the easier it is to find the things I need. I also want to spend more time reading some of the great books of faith I have been waiting to read. I want to be more available to help others this year. I want to be available for all my church responsibilities. In order to do these things without causing chaos in my home life, I need to have things in better order. Though it’s impossible to have everything in order, I have much room for improvement! Though I enjoy my time online, I do plan on reducing it in 2014. There are times when I use it as a distraction from doing things I know I need to get done. With smart phones and laptops we are now available to others pretty much 24/7. This coming year I plan on turning both off more often. I want to spend more time alone with the Lord. It’s through this precious time that I am being equipped to be the person He has called me to be and to do the things He has created me to do. Paul reminded us that our time is valuable and that we are not to waste it in Ephesians 5:15-17 ESV 15 Look carefully then how you walk, not as unwise but as wise, 16 making the best use of the time, because the days are evil. 17 Therefore do not be foolish, but understand what the will of the Lord is. I have found clutter really does impede my ability to function effectively, in my home and in my spiritual life. At times, it leaves me feeling confused. 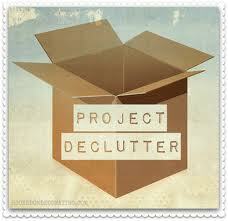 So in 2014, I am asking the Lord to guide me through the necessary steps to de-clutter both. I want to be ready for whatever He brings my way, inside and outside my home!